Meida Teresa McNeal is Artistic and Managing Director of Honey Pot Performance. She received her PhD in Performance Studies from Northwestern University and her MFA in Choreography & Dance History from Ohio State University. 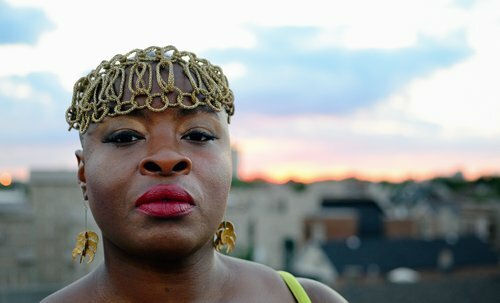 Over the past two decades, she has produced numerous creative projects as both a solo artist and with Honey Pot Performance, with works performed in Illinois, Rhode Island, Ohio, California, and Trinidad. Positioning her work as an Independent Artist and Scholar at the intersection of performance studies, dance and critical ethnography, she has taught courses in dance, critical performance ethnography, and black diasporic cultural production at Northwestern University, Brown University, Governors State, and Columbia College Chicago. Meida also works with the Chicago Park District as Arts & Culture Manager supporting community arts partnerships, youth arts, cultural stewardship, and civic engagement initiatives across the city’s parks and cultural centers. Whether creating new work, facilitating a workshop, building community partnerships and programs around shared public space, teaching, or writing, for Meida all roads lead to the merging of theory and practice into lived applications that cultivate dialogue, decolonize knowledge, and shift consciousness. Abra M. Johnson is the Education and Dramaturgical Coordinator, as well as a co-founding member of Honey Pot Performance (HPP). A proud Chicagoan and Westsider, she has held a variety of local educational activist posts for two decades. Currently, she is a tenured, Assistant Professor of Sociology and co-chair of Social Sciences at Malcolm X College, one of the City Colleges of Chicago (CCC), and a faculty member within the CCC/DePaul Bridge Program. Having spent the last decade teaching sociology while creating performance art, her scholarly interests center the convergence of race, gender, class, sexuality, and, recently, age, in pop cultural media, that, on one hand, coalesce into both a creolized national language and a meta-cultural dialogue regarding these paradigms of difference, and, on the other, emerge as both marginalizing and galvanizing political culture discourses, particularly within the music- and movement-driven genres and cultures of Hip-Hop and (Chicago) House--the nodes and focal points of her fascination. These experiences and interests are the channels through which Professor Johnson persistently pursues a public sociology, pushing beyond the discipline’s academic boundaries to engage with the complexity of communities that define and typify global cities like her hometown, Chicago. Aisha Josina Jean-Baptiste is a healer, who hails from an ancestral line of healers. She is a founding member of Honey Pot Performance, and a trauma-informed Licensed Clinical Social Worker. Aisha's extensive background in organizing, performance poetry, reproductive health education, and trauma-focused mental health services, has served as rich context for her offerings as a co-collaborator of Honey Pot Performance. Aisha is currently serving the Baltimore area under her newly established practice, Life Therapeutic Services, LLC. Her greatest accomplishment is her daughter Ajile. Lifelong Chicagoan Felicia Holman is co-founder of the Art Leaders of Color Network and Honey Pot Performance (‘HPP’). Felicia is also Artist Services Manager at Links Hall. Felicia creates and presents original interdisciplinary performance which engages audience and inspires community. HPP credits include The Ladies Ring Shout (2011), Price Point (2013), Juke Cry Hand Clap (2014), and Ma(s)king Her (2016). Felicia is also an admitted Facebook junkie and is honored to join new improvisational performance collective, The Instigation Orchestra & The Djasporas---musicians & dancers from Chicago & New Orleans. Felicia sums up her dynamic artrepreneurial life in 3 words—'Creator, Connector, Conduit'. Jo de Presser (aka Marlon Billups) is a DJ, Poet, and currently, Music Curator and Collaborator for Honey Pot Performance. Jo, has been DJ’ing throughout Chicago House scene since 1987. Starting at DiVinci Manor with promoter Quik Claude. He DJ’ed along side such Chicago House legends as Lil’ Louis, Farley Jackmaster Funk, Gene Hunt, Terry Hunter, and more. His works of poetry and spoken word have been published by Third World Press, Chicago State University, Robert Morris University and more. He has performed poetry and DJ’ed in Festivals, Clubs, Radio Stations, Universities, and in various cities and Canada. Your contributions help support critical everyday organizational needs including rehearsal space, marketing, production expenses and other operational needs needed to produce our jam packed year full of performances, workshops, critical publications and a new digital mapping initiative!